The Charleston murders are consistent with the violence and racism that has characterized America since its creation. 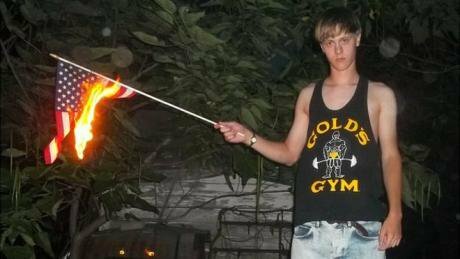 Ironic: Charleston murderer Dylann Roof burning an American flag. I am the daughter of two Zimbabwean immigrants. My parents were born in what was then Rhodesia, an apartheid state ruled by a white minority government. My parents have not told me much about life in Rhodesia outside of my mother's time spent in an internment camp and my father's brush with political activism in his youth. They are now both naturalized American citizens, and I am sure they would prefer to not resurrect memories of growing up under apartheid. When I saw Dylann Roof wearing a jacket with a patch of the flag of the Union of South Africa (a South African apartheid flag), I was shocked and disgusted. But when someone pointed out that the other flag was that of Rhodesia, one I had never seen until Thursday (and one that my mother did not initially recognize), I was sick to my stomach – even more so when I learnt his blog was called "the last Rhodesian". This past Wednesday evening, Roof entered Emmanuel African Methodist Episcopal Church – a church in Charleston, South Carolina with historical importance to the Black community – and opened fire, killing nine churchgoers. American white supremacy had, in a way, come full circle. We're missing something when we debate the nature of Roof's actions and whether they constitute a hate crime or terrorism. Why would he emblazon his jacket with apartheid South African and Rhodesian flags and have an affinity for southern Confederate iconography and beliefs if a common thread did not link all three things together? The common thread is settler colonialism, and American white supremacy as settler colonial nostalgia. Roof wearing those apartheid patches on his jacket while simultaneously embracing the white supremacist narratives of the American Confederate South is nostalgia for this projected past. Settler colonialism is a process in which foreign families move into a region claimed by those foreigners as their own, or on behalf of an imperial power: the United States and Rhodesia were colonized by the British, and South Africa by the Dutch. This colonization is often characterized by the displacement and/or forced assimilation, genocide of indigenous populations, and the imposition of power dynamics of settler (i.e. white) supremacy. While settler colonial processes are unending, colonialism in its golden era was a time of global white leadership and dominance, where indigenous people were raped and enslaved and resources were plundered. The antebellum south was a slave economy in which white owners had unfettered access to Black bodies. While the media may try to construct Roof as some kind of lone anomalous monster or extremist who committed an horrific hate crime in a vacuum, he is not an extremist. He is a terrorist, but he is not an extremist. As a first generation American of Zimbabwean origin, my interactions with whiteness include both American and Rhodesian settler colonial forms, though in a new and jarring way. The similarities between these structures became more apparent when I learnt about the role that Rhodesia plays in American white supremacist militia and paramilitary culture. I see little difference between the Transatlantic slave trade, state-sanctioned segregation and American apartheid, the entitled land theft of Manifest Destiny, the slaughter of indigenous people, medical experimentation on Black bodies, the state’s infiltration and assassination of resistance groups and leaders of color, and Dylann Roof’s slaughter of nine innocent Black people in that church. The conversation that white America is having is incomplete. Beyond many people's failure to admit his act was one of terrorist violence (indicting the state as a perpetrator of terrorism as a result), there is a failure to recognize that his actions are consistent with the violence and racism that has characterized America since its creation. Roof's whole-hearted embrace of Confederate ideologies, his hatred of Blacks and Latinos, his naming of the “Jewish problem”, and his perception of East Asians as a “model minority” and the group in most active collusion with white supremacy may all be considered fringe and extremist views, but they are all political understandings that exist within mainstream conservatism and within mainstream whiteness more broadly. President Obama called racism “a blight that we have to combat together.” We do not need a continued insistence on moving forward in solidarity when we still do not have a proper understanding of the past. We need white Americans to be jolted from their racialized ignorance and fragility and to begin to be honest about what America historically has been and continues to be: honesty that the shining “city upon a hill” is ideologically and functionally similar to other racist settler colonial projects around the world. While Dylann Roof’s manifesto was unspeakably racist and admittedly painful to read, white self-identified liberals or progressives should read it. The description of white supremacist racial processes is surprisingly astute (though his understanding unfortunately led him to violence rather than an active challenge of their legitimacy and function). In particular he takes to task white liberals who move to areas to attend better schools. His criticism of “white flight” to suburbia points out that many white liberals are not vastly different from him in their internalizations of white supremacy (though their expression differs drastically). While all non-Black people of color must address anti-Blackness in their own communities, white liberals should very carefully analyze their own politics and the ways in which their white privilege ultimately maintains structures of racial oppression. There are some very tangible things that white liberal and progressive allies can do to challenge white supremacy in the spaces they occupy. They can stop allowing casual racist jokes and comments to go unchallenged. They can share anti-racist narratives from Black people and people of color rather than simply similar comments made by white liberals. They can be mindful of the demands that they as “allies” make from Black people (e.g. demanding support and information, which takes away a person’s time and energy). But the most crucial thing white people can do is to engage mindfully with people of color in discussions of racism: to recognize the assumptions they carry as a result of socialization are likely steeped in white supremacy to some degree, and to really listen to and trust what people of color tell them about racism. Only through honest discussions about white supremacy and actively taking responsibility for identity-privileging structures can white Americans play their role in upending and ultimately dismantling still existing settler colonial structures.